Potential VP candidate recounts faith journey as a child and family's return to Catholicism. Jae C. Hong | The Associated Press Republican presidential candidate, former Massachusetts Gov. 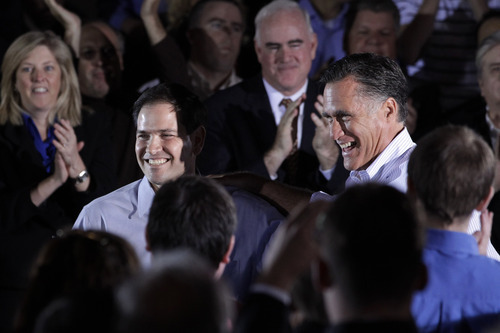 Mitt Romney is joined by Sen. Marco Rubio, R-Fla., during a town hall-style meeting in Aston, Pa., April 23, 2012. 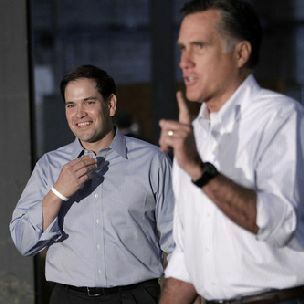 Jae C. Hong | The Associated Press Sen. Marco Rubio, R-Fla., left, joins former Massachusetts Gov. Mitt Romney for a news conference prior to a town hall-style meeting in Aston, Pa., April 23, 2012. Washington • Florida Sen. Marco Rubio credits his short-lived time as a Mormon for providing a moral compass in his youth, though he also discloses for the first time his family's struggles with the constraints of the faith and his eventual return to the Catholic fold. In his new autobiography, An American Son, available Tuesday, the Florida Republican candidly discusses the three years he spent as a member of The Church of Jesus Christ of Latter-day Saints and lauds the Utah-based faith for helping his Cuban-immigrant mother and him when they moved from Miami to Las Vegas when he was a grade-schooler. "All in all, the Mormon church provided the sound moral structure my mother had wanted for us, and a circle of friends from stable, God-fearing families," Rubio writes in his book. "When we left the church a few years later, mostly at my instigation, we did so with gratitude for its considerable contribution to our happiness in those years." Rubio  a potential running mate to presumptive presidential nominee Mitt Romney, a Mormon  talks for the first time in his memoir about converting to the faith, a family trip to Provo and Salt Lake City to visit temple sites and how seriously he took his new religion. "In contrast to my parents, I immersed myself in LDS theology, and understood it as well as an 8-year-old mind can," Rubio writes. "Although my school grades were never impressive, I was a voracious reader, and I studied church literature and other sources of information to learn all I could about the church's teachings." Rubio's journey to Mormonism began when his family settled in "fascinatingly strange" Las Vegas in 1979. The family's new home, on a cul-de-sac in a working-class neighborhood, was right across the street from his new friends, the Thiriot boys, who were Latter-day Saints. "They were a close-knit family who were always doing things together," Rubio says. "They represented the kind of safe, respectable family life my parents wanted for us." The faith's wholesomeness, its values and the community closeness that came with it drove Rubio, his mother, Oriala, and his sister, Veronica, to baptism. His father, Mario, didn't convert, Rubio writes. Bryan Thiriot, a Republican consultant and legislative chairman of a St. George district, recalls growing up with Rubio, who was also known as Tony, a shortened version of his middle name, Anthony. "We were very close friends growing up there," Thiriot recalls. The two attended school together, sat by each other in church, teamed up on camping trips and competed in Pinewood Derbies. "I would say this straight up, Marco is a very religious man," Thiriot told The Salt Lake Tribune, noting long conversations the two had about faith and politics. "We actually had conversations about Social Security." On occasion, Rubio's chatting got to be too much. "He never stopped talking. He was a constant talker," Thiriot says. "Sometimes he talked so much that he'd get in trouble at school." While LDS values and morals drew the Rubios to the faith, Rubio says, it was the religion's ban on tobacco, alcohol and coffee that made staying tough. "Some of the church's rules were difficult for my parents, especially my father, to abide by," Rubio says, adding that his dad, who never joined the LDS Church, had smoked since age 13 and worked as a bartender. Rubio says he chided his father for slinging booze, but also noted that Cuban coffee was a staple that neither parent would give up. Eventually, a friend from Rubio's grade school who was Catholic piqued the future senator's interest, and he began learning about the faith his mother grew up in. He said leaving the Mormon religion was his decision. "We left the Mormon church with nothing but admiration for the place that had been our first spiritual home in Las Vegas and had been so generous to us," Rubio writes. "I still feel that way." Another book out Tuesday, The Rise of Marco Rubio, by The Washington Post's Manuel Roig-Franzia, also sheds light on Rubio's time as a Mormon. Roig-Franzia writes that Rubio and his cousins adored the Osmond family and Rubio, his sister and their cousin Michelle performed songs from Donny and Marie. The book's author also notes that "faith was a central tenet of Rubio's life" and noted that a young Rubio had an unusual control over his family's religious identity, helping bring them to the Mormon faith and then back to Catholicism. "He really convinced his whole family to switch religions," says cousin Michelle Denis. One thing is clear, Roig-Franzia writes, the Rubio family never asked to be removed from the LDS rolls, "meaning they may still be counted as Mormons by the church."